This exercise is about monitoring actual financial performace against budgeted financial performance by calculating the magnitude of the variance (difference) in both dollar and percent terms. 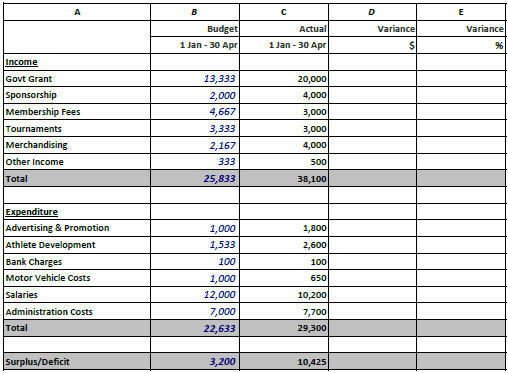 You are provided with an Excel template that compares actual income and expenditure with budgeted income and expenditure. Your task is to calculate the variance (difference) in dollar and percent terms. Advice is also given on how to signify whether a variance is favourable or adverse by the use of brackets, and how to achieve bracketing around negative numbers in MS Excel.